To understand what tendonitis is and why it can hurt so much, first, you have to understand what the tendons do. A tendon is a fibrous cord like connective tissue which attaches muscle to bone. 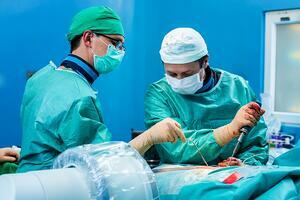 The tendon is responsible for helping move a given bone or structure. Tendinitis is the irritation of that fibrous cord responsible for helping move a given bone or structure. It can be easy to see how swelling, irritation of an Achilles Tendon, Quadriceps Tendon, Biceps Tendon and so on could be painful. With 1,320 tendons in the body theirs a lot of essential tendons, but today we are going to be talking about the major ones prone to tendonitis from common receptive motions. Repetitive motion injuries are very prevalent within the United States. Repetitive motion injuries are a leading cause for specialist visits. 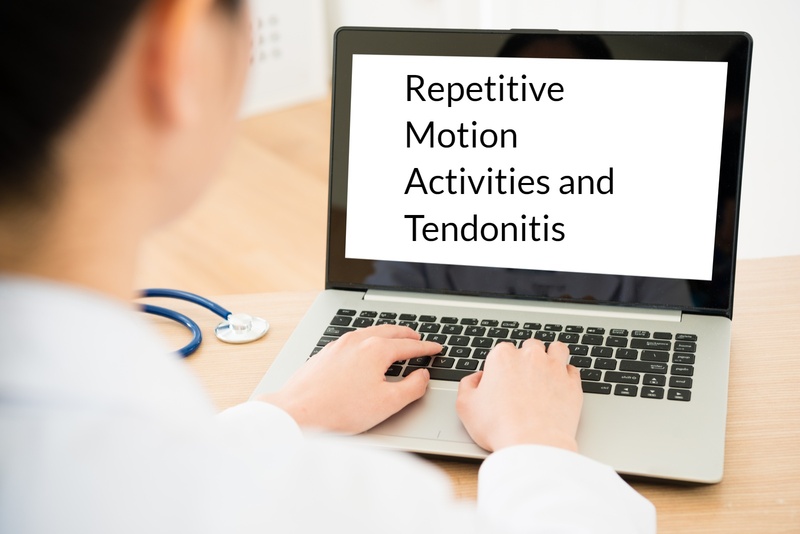 These repetitive motion injuries make up over 50% of athletic-related injuries seen by doctors which results in a significant loss in school time or losses in work within the workforce. An example of how repetitive motion can give way to injuries. A typical high school track athlete lands on his left leg every 2 meters, in a 400m lap he pushes off 200 times on his left leg, in a mile he is now at 800 steps on his left leg. This level of repetitiveness is significantly magnified when looking at a typical workout being 8 to 10 miles with warm up and cool down. This high school track athlete has now landed on that one leg 6,400 times to 8,000 times. According to the hypertext book, this is only made worse by the forces at play. For example, a person weighing 670 newtons (150 pounds) can experience forces of up to seven times their body weight or 4,700 newtons (1,000 pounds). That is a ton of force and a lot of repetitive motion. With this it can be easy to see how someone with slight knee pain, leg pain, foot pain, could end up with a repetitive motion injury. These injuries are only made worse after the activity, as often just because the workout stops the motion does not. All of these disorders are made worse by the repetitive actions of daily tasks. Everyday actions, such as climbing the stairs, scrubbing a floor, stacking items, can make symptoms worse or even lead to a repetitive motion injury. Tennis elbow or its formal name Lateral Epicondylitis is very common to a broader group of people than just tennis players despite its name suggesting otherwise. 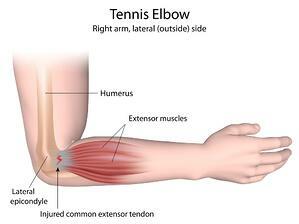 The repetitive wrist and arm motions can cause tennis elbow. Pain is the primary symptom usually occurring on the outside of the elbow and sometimes forearm and wrist, which makes it very similar to golfers elbow. Golfer’s elbow or its formal name medial epicondylitis is common to a wide range of people outside of golfers. Golfer’s elbow is inflammation of the medial epicondyle on the inside of the elbow which makes it similar to tennis elbow except it is on the medial epicondyle whereas tennis elbow affects the lateral epicondyle. An easy way to recognize this is if you are having pain on the inside or outside of your elbow. If it's the inside you are looking at golfers elbow. Pitchers shoulder can be tied to a larger group of medical terms related to the shoulder but some of the more common injuries related to pitchers shoulder are rotator cuff tendinitis , rotator cuff tear, or impingement syndrome. While this is a larger variety of problems the cause is still the same, Repetitive Motion is once again the culprit. Swimmer's shoulder is a common name for impingement syndrome of the shoulder. This is a general term used to describe an overuse shoulder injury occurring in swimmers. Like the other names while this can be common in swimmers this injury can affect people who never swam at all. It represents a chronic irritation of the shoulder's soft tissues (tendons, muscles, ligaments) and can be common in other people who have done any work or activity with repetitive shoulder motion. A tendon is a fibrous cord like connective tissue which attaches muscle to bone. The tendon is responsible for helping move a given bone or structure. When this structure becomes inflamed, it can lead to minor to moderate pain. Pain is all-determining by how severer the tendonitis is. In cases of tennis elbow tendonitis can cause weakening of grip strength. 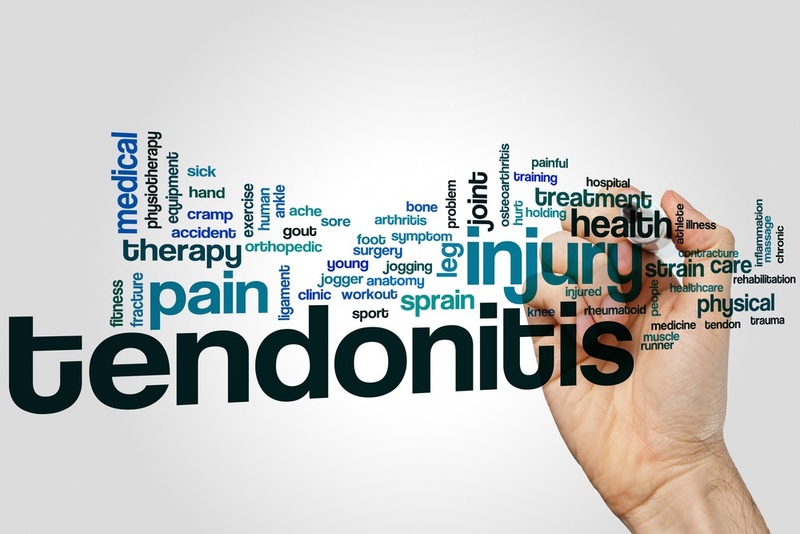 In other instances, tendonitis can lead to the weakening of the tendon and possibly tears or ruptures, so rest is important and as always speak to a professional if you have any questions or concerns. With this, if tendonitis is caught early enough most cases of tendonitis will be just fine if given proper rest. If problems persist, you may want to see a specialist who could prescribe physical therapy and medications to reduce pain and or inflammation such as an NSAID or a Medrol dose pack. If tendinitis is severe and leads to the rupture of a tendon or continues to persist, you may need surgery. As always if you have any question contact a specialist. How you treat your tendinitis depends largely on where it’s located and the severity. Most forms of tendinitis can be treated conservatively without surgery, using a combination of approaches: RICE treatment, bracing or taping, physical therapy, NSAIDS and improving or tuning up one’s sports gear. In some cases, additional medication and therapeutic modalities may also help to reduce inflammation. For example, a Medrol dose pack or a limited number of cortisone shots can help alleviate inflammation and other symptoms of tendonitis. Other therapy’s such as Platelet-rich-plasma therapy and shockwave therapy have also proven helpful for many athletes. 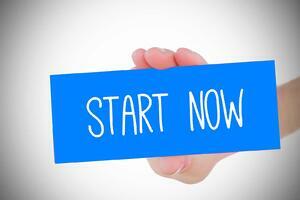 HOW CAN I PREVENT GETTING INJURED IN THE FUTURE? Change it up.Cross training or just switching up activities can be important if you find a given activity or sport seems to be causing persistent pain. If running is causing you pain try switching up running for biking. If a particular activity is bothering you try mixing other tasks in-between or take more frequent breaks to allow your body to recover. The answer is in the technique.If you notice pain every time you do a specific activity or sport it might be possible technique is to be blamed. Try to examine your technique, for instance not lifting with your back, or possibly worming up for a more extended period of time. Be sure to ask others if you are not able to figure it out your self, or consult a professional in your field or sport. Proper workplace ergonomics.Also use standard workplace ergonomic practices, such as back braces, knee braces, replacing shoes appropriately, proper desk to monitor level and other techniques that may apply to your workplace or activity. 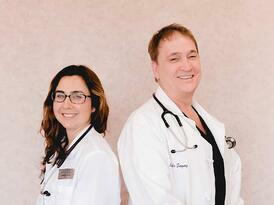 As always our helpful staff here at Coastal Orthopedics in Corpus Christi, Texas are available to answer any of your questions at (361) 994-1166.